A life insurance settlement refers to the sale of an unwanted or unneeded life insurance policy to a third party. A life insurance settlement refers to the sale of an unwanted or unneeded life insurance policy to a third party. With so many people losing their savings and retirement fund assets, life settlements have become more popular over the past few years. Once the ownership rights have been signed over, the third party also becomes the beneficiary of the policy. The buyer of the policy must continue making policy premiums in order to keep the policy in force. At the time the insured passes away, the buyer of the policy will receive the death benefit proceeds – which they hope are higher than the amount of the lump sum that they paid to the seller plus the additional premium payments that were made. Thus, in some ways, life settlements can be thought of as a win-win scenario for both the buyer and the seller. For the buyer, there is the chance to profit on the “spread” between what they paid into the transaction and what they received in death benefit proceeds. For the seller, the lump sum received is typically much more than they would have received had they cashed out the surrender value of the policy, or simply cancelled the policy altogether. There are essentially two different types of life settlements. 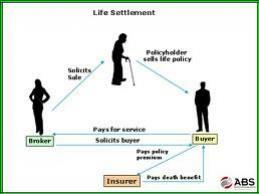 One, referred to as a viatical settlement, is the sale of a life insurance policy of a terminally ill policy holder. Typically, these insureds need money right away in order to pay for medical procedures or medications. The other type of transaction, simply referred to as a life settlement or senior settlement, involves the sale of life insurance policies from individuals who are age 65 or over. These individuals are not necessarily terminally ill. However, they may have a need for immediate cash, or they may not need their policy any longer and would like to recoup some of the funds paid into it over the years. Most life insurance policy buyers, or life settlement brokers, require that the policies being considered for purchase have a minimum face amount. In addition, the insured individuals on these policies are typically required to have at least some type of health condition and meet certain projected life expectancy requirements. Are Life Insurance Settlements Regulated? In the U.S., life insurance is regulated on a state by state basis. When it comes to life settlements, one of the best resources to help in determining where your state falls in terms of regulation is the Life Insurance Settlement Association. Through this association, you will be able to find both state by state, as well as federal viatical and life settlement legal resources that can help you with information regarding your state's statutes, regulations, and key definitions. Most importantly, do your research and beware of the unknowns. A life insurance settlement refers to the purchase of the insurance policy before the maturity date or the demise of the policyholder. There are some life insurance settlement companies or brokers whose sole business is the purchase of life insurance policies from the holders. These companies will pay a fixed portion of the policy amount to the holders and make all the necessary documentation with the insurance company for the change of the ownership and the beneficiary of the policy. Once they got confirmation from the insurance company stating the change of the ownership, they start paying premiums to the insurance provider. They receive the full policy amount either on the date of the maturity or on the demise of the policy owner, whichever is earlier.